An exhibition and conference for producers and users of sustainable building materials, and anyone who would like to find out more about them. 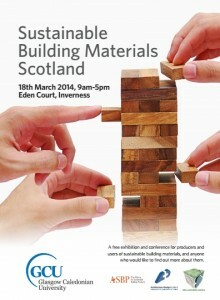 Hear from leading producers and users of sustainable building materials: Atkins Architecture (East Lothian); Anu Green (Cork, Ireland); Ecocel (Cork, Ireland); Ecological Architecture (Perthshire); Enviroglass (Shetland); FH Wetland Systems (Co. Clare, Ireland); Locate Architects (Dunblane); MAKAR (Inverness). Hear from experts in sustainable buildings: Gary Newman, the Alliance for Sustainable Building Products; Lori McElroy, Architecture and Design Scotland; Sue Roaf, architect of the Oxford Ecohouse and author of The Ecohouse books; Tom Woolley, Rachel Bevan Architects, Northern Ireland; John Easton, SUSTaim; Ross Cairns, Chartered Institute of Architectural Technologists and Inverness College. Organised by the Natural Energy Efficiency and Sustainability (NEES) Project, Glasgow Caledonian University. Funded by the Northern Periphery Programme, European Regional Development Fund. Please email the organisers if you would like more information or to request a free stall in the exhibition. This entry was posted in Uncategorized, Workshops on February 7, 2014 by Ric.